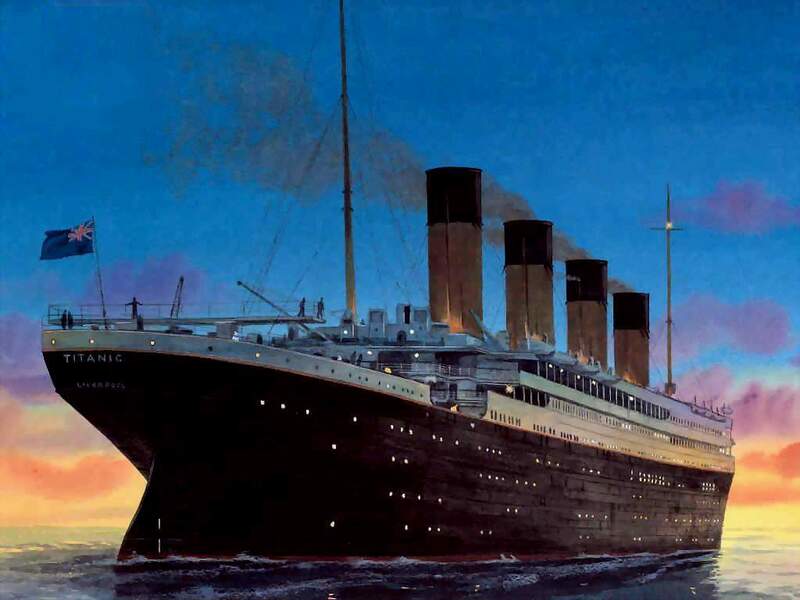 We must begin with the story of passenger ship ‘RMS Titanic.’ Built in 1909 in Belfast, the ship was created to be one of the largest and most luxurious vessels in the world. The hull was divided into 16 watertight compartments which were supposed to make the ship almost impossible to sink in the event of impact damage to the hull. The steel plates were fixed to the hull with more than 3 million rivets, which were unfortunately brittle when cold and could fracture. One theory suggests that the sinking of ‘RMS Titanic‘ on her maiden voyage was partly down to this. There is no doubting that the glancing blow which gouged along the side of the ship was far more dangerous than any single impact hole would have been. The damage along the hull caused 5 compartments to flood, tragically, just one more than the ship could safely bear and still remain afloat. One important question in relation to the sinking is how the lookout failed to see a huge iceberg appearing on the horizon. Normally it would create a large silhouette against the night sky, but nothing was seen until it was too late to avoid a collision. The most convincing theory is that an optical illusion was created as the ship passed from slightly warmer water into an ice cold stream which carried icebergs south. The icy air above the sea was a little denser and caused light to bend as it passed through it. This meant that the iceberg emerged from the darkness without ever appearing on the horizon, because the bending light meant the lookout was seeing a horizon much further away, as light bent across the curvature of the earth. Perhaps the most famous ship in British history is the ‘HMS Victory‘. Commanded by vice-admiral Horatio Nelson, the ship saw its finest hour at the battle of Trafalgar in 1805. With 104 guns and a man of Nelsons great experience and tactical skill, ‘HMS Victory’ was the obvious choice of flagship as the British navy sailed to meet the combined strength of the French and Spanish fleets. Despite being outnumbered, the royal navy defeated the French and Spanish, although HMS Victory sustained heavy damage. Nelson had insisted upon being on deck throughout the battle, as an example of supreme courage to his men. He was a magnet for sharpshooters on the mast of the French ship ‘Redoubtable’ which engaged with ‘HMS Victory’ and was struck by a musket shot during the battle. He was carried below deck with serious injuries but managed to cling to life for more than 3 hours, long enough to be told that they had won the battle, before dying. The ‘HMS Victory’ was involved in other battles before Trafalgar and has since been preserved as a museum ship. ‘HMS Victory’ remains the oldest naval ship in the world that is still in commission. ‘The Bismarck‘ is certainly one of the more famous ships from world war 2 and was once the pride of the German fleet. One of the largest battleships ever built, she went into service in 1940 and after raiding ships which were carrying supplies between Britain and North America, was engaged by the royal navy off the coast of Denmark. The Bismarck destroyed ‘HMS Hood’ and forced ‘HMS Prince of Wales’ to retreat during the battle, before heading towards France. The royal navy pursued in full strength, and caught up with ‘The Bismarck’ after the steering had been damaged by bombers from the ‘HMS Ark Royal.’ The final battle saw ‘The Bismarck’ sustain heavy damage, and she was scuttled by her crew, despite already being fatally damaged. The wreck of ‘The Bismarck’ was rediscovered in 1989 and remains on the sea bed. Another famous ship with an interesting past, is the ‘Golden Hind,’ which was originally named ‘Pelican.’ Captained by Sir Francis Drake, this galleon circumnavigated the globe between 1577 and 1580. This mission had official approval from the queen, and involved the capture of a Spanish galleon which was carrying vast amounts of gold at the time. The ship remained afloat for more than 100 years after its most famous voyage, before eventually being broken up in the late 1600’s. Although the existence of this ship is questionable, it is undoubtedly an interesting ship which has made an appearance in modern film franchise ‘Pirates of the Caribbean.’ Named ‘The Flying Dutchman,’ this ghost ship is apparently fated to sail the seas forever and has been sighted several times in history, often with multiple witnesses. References to a ghostly ship with a fluorescent glow have been reported in the 18th,19th, and 20th centuries, and in nautical folklore, any sighting of ‘The Flying Dutchman’ is a bad omen for those who lay eyes upon it.